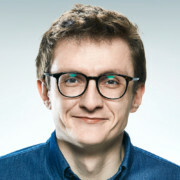 Eugene Fedorenko is a product designer at Wildbit, working primarily on Conveyor at the moment and Beanstalk, Postmark, and DeployBot in the past. Follow on Twitter, peek at Instagram, look over a shoulder on Dribbble and GitHub, or just send an email. See what exactly I am doing at Wildbit, or peek at Dribbble. I made small contributions to a few open-source projects and maintain Wildbit-specific configs for Stylelint and postcss-sorting.